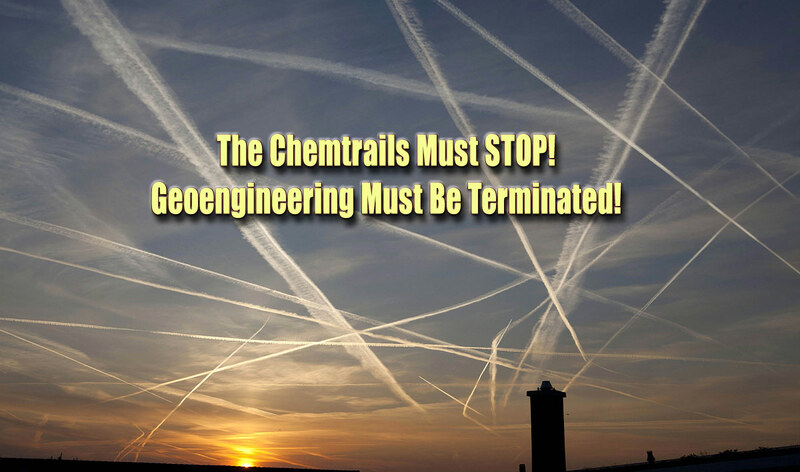 by Dan Eden for viewzone.comThe word “chemtrails” is a knock off of the word “contrails.” Contrails are trails of condensation that can be seen in the sky when a jet airplane is traveling at above 30,000 feet altitude. Up there, almost 6 miles high, the air is thinner and colder — very cold. Outside temperatures can dip to minus 60 F and the air is often full of minute ice crystals that hang suspended and invisible. When these ice crystals get sucked into a hot jet engine they turn into a gas, like steam, and can be seen as puffy white cloud-like lines that follow behind the jets. They usually dissipate and fade away as the moisture once again returns to form invisible ice crystals. “Chemtrails” are something different. 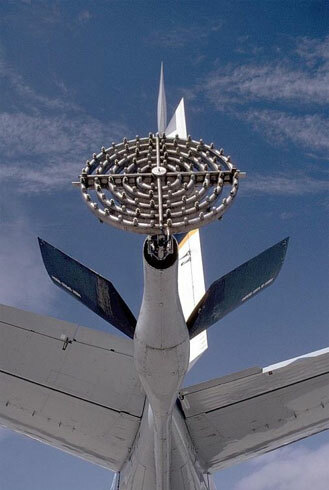 They are often formed behind jet aircraft at a much lower altitude and seem to persist in the sky. They often have a different color from contrails and frequently exhibit a rainbow spectrum if lit just right from the sun. The confusion between these two kinds of phenomenon is what made us hesitate to write about them in Viewzone. We figured that with the dramatic increase in air transportation there would naturally be many more contrails in the sky and that worrying about this was just another form of modern paranoia. 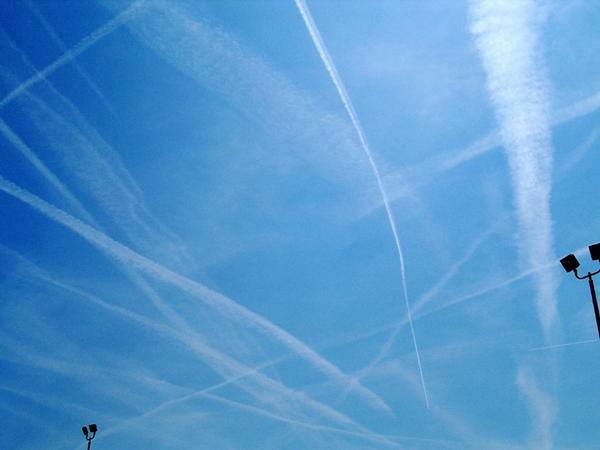 In this article you will learn that chemtrails are real and contain aluminum particles. 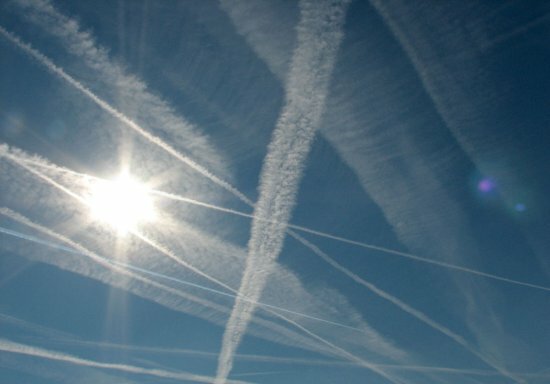 They have been sprayed in the atmosphere in an attempt to protect micro-circuitry and semiconductors — primarily involved with avionics — from atmospheric and solar radiation that causes them to fail. [click for larger view]In the photo above, not all of the white lines are “chemtrails.” Probably most are regular contrails or “con”densation trails from jet commercial airline flights. It just illustrates the severity of the problem — even without any conspiracy. The conspiracy, however, adds another degree of complexity to the problem. 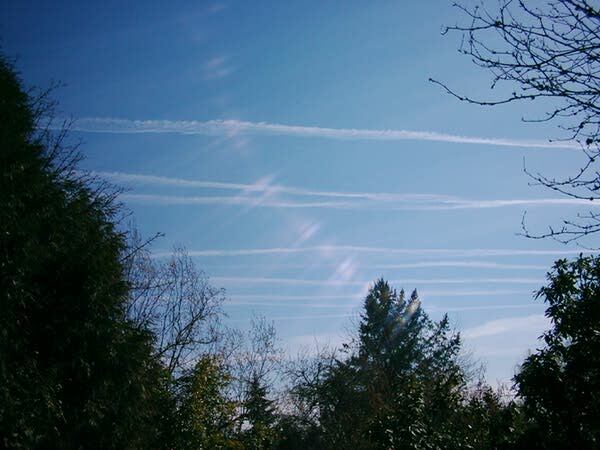 It claims that certain trails are not a mere byproduct of modern aviation but rather a deliberate attempt to introduce cloud-like formations in the atmosphere, restricting our sunlight and possibly poisoning us with chemicals. Hence the term “chem”ical trails. The term “chemtrail” was first introduced by journalist, William Thomas, in 1997. He wrote about something that many people had been seeing in the skies above their homes all across America. It wasn’t so much that people noticed the white trails from jets, or even that there appeared to more of them than they remembered in the past, but that the aircraft making these white lines were flying in unusual ways — often in zig-zag patterns or making multiple parallel lines of white trails that tended to expand and eventually cover the sky with a canopy of clouds. Initially, people began to question the government, thinking it was some kind of weather control project, but NASA and NOAA and even the military have denied any knowledge or involvement in the phenomenon. Independent researchers, convinced that something is going on, have posed sinister theories which have gained acceptance from the government’s apparent lack of interest and even ridicule of the idea that there is anything unusual. It was the late Edward Teller, member of the Manhattan Project and father of the Hydrogen Bomb, co-founder and director of the Lawrence Livermore National Laboratory, who proposed this geo-engineering technique together with Roderick Hyde and Lowell Wood and who designed a variety of mixtures according to the specific tasks they have to perform, among which figure the deployment of “electrically-conducting sheets” or “metallic ‘nets’ of ultra-fine mesh-spacing” in the stratosphere. But their concern wasn’t global warming. 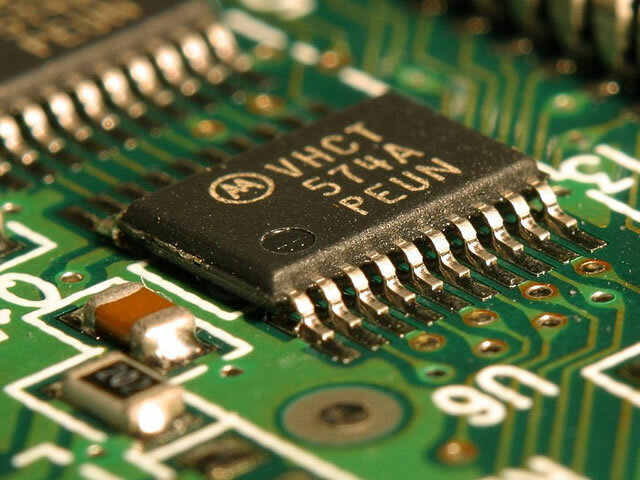 It was the growing dependence on, and vulnerability to semiconductors. 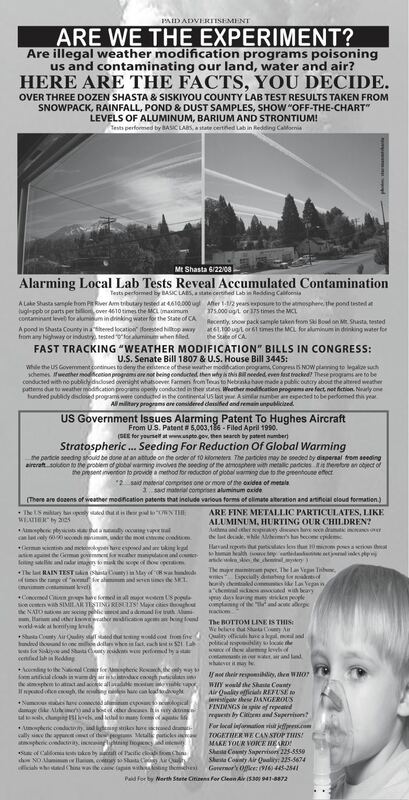 In a 2009 interview with Ludwig Glinz about ‘Sferic Frequencies, Semiconductor Technologies and their effective Preservation and Protection,’ Uwe Behnken, founder of LiveNet Concept 2010 and long time activist against Chemtrail Spraying, suggests that the massive injection of toxic substances into the stratosphere ever since the nineties bears a direct relation to the protection of highly sensitive semiconductor technologies. The Single Event Upset happens when the flow of data (“1’s” and “0’s”) is corrupted. Maybe when reading the binary code from a memory or processor an extra bit is added or lost. This is a fairly regular occurrence and is usually corrected within the device by a special code that counts the number of bits, checks to make sure the same number was received, and orders them to be repeated if there is a discrepancy.